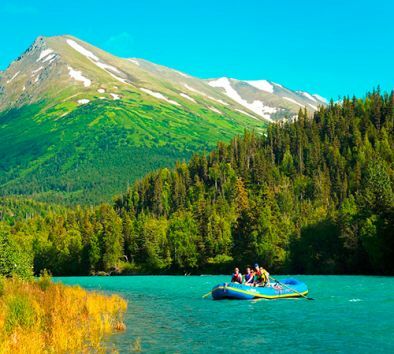 Relax and enjoy a leisurely float on the turquoise waters of the Kenai River and into the heart of the Kenai National Wildlife Refuge. Enjoy the solitude and serenity of this great family tour far from the crowds. Your experienced guide leads you on an 11-mile float trip along the Upper Kenai River surrounded by the Kenai Mountains. Keep your cameras handy as the Refuge is home to Alaskan brown bears, moose, bald eagles, salmon and other Alaskan wildlife. Dress in warm layers. Bring gloves and a camera. Time on raft is approximately 2½ hours.